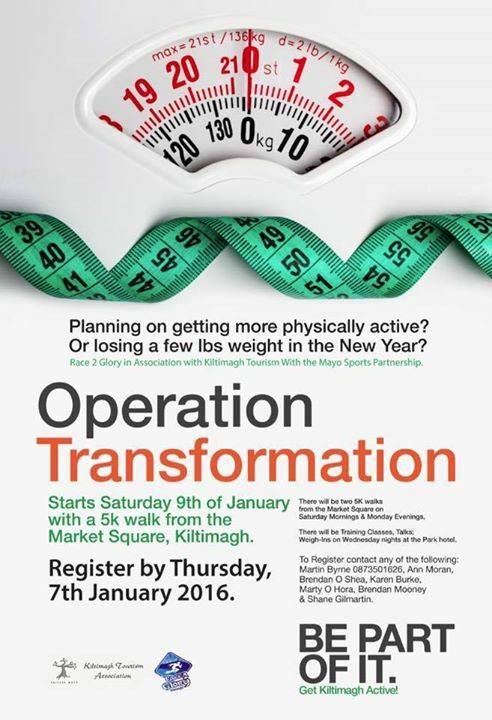 Kiltimagh Operation Transformation recommenced on 4th Jan 2017, when over 300 people assembled in the Park Hotel to sign up with our 8 enthusiastic leaders. Each Team leader has their weight recorded and revealed every Wednesday night (team members weight is kept confidential). Thanks to Clare and staff of the Park Hotel for providing the venue each week. The team leaders and their teams are also raising money for their chosen charities. There are sponsorship cards in circulation or donations can be given to the leaders or any committee member. We got off to a great start with all the leaders organising walks, dance classes, aqua aerobics, cycles (for all abilities), early morning workouts, scavenger hunt, football skills, basketball, yogalates, to name but a few activities. The Saturday morning and Monday evening 5k walks are very popular again this year preceded by Avril “the hips” warm up! 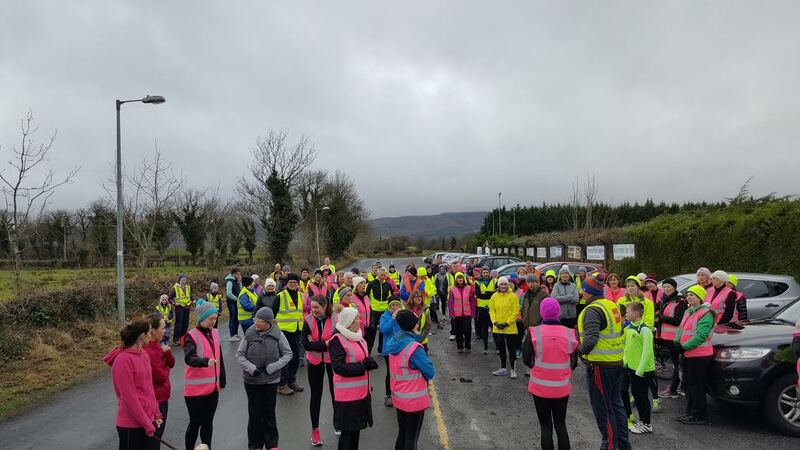 A special word of thanks to SuperValu for sponsoring water for the Saturday morning walk, to the Ward family for manning the water station and to Gary Smyth of Heneghan’s pharmacy for sponsoring the lovely pink high vis bibs ensuring we are all seen while out on our various activities, day or night. Participants enjoyed two very informative talks by local ladies, Dietician Aisling Byrne who informed us all of the dos and don’ts of our new lifestyle change….. Remember “you cannot outrun a bad diet” and Psychologist Dr Jane McNicholas, who talked to us about comfort eating and ways of overcoming it. 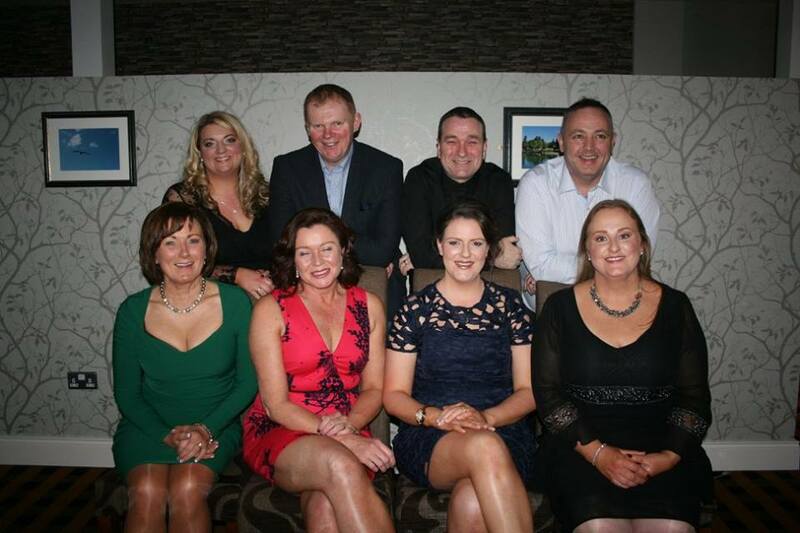 Week after week the weight loss has been phenomenal and so far to date we have lost an incredible total of 699lbs and there are still two weeks to go before the “Big Reveal Night” on Fri 17th February in the park Hotel. 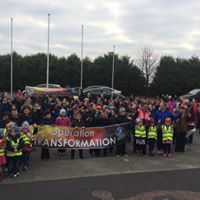 But Operation Transformation is not just about losing weight, it is a lifestyle change, it is about getting out and about with members of our community, young and old. It is about making new friends. It is about trying out new activities. It is about having fun while getting healthier and fitter and hopefully we will be encourage to continue on with our new lifestyle throughout the year. A big thank you to our MC Brenda McNicholas, to our “Weigh in Ladies” Bernie Corry, Bernie Byrne, Marcella McDonnell and Avril FordeMcGreal who are there every week to record all our weights. Thanks also to Carroll’s Londis and Kiltimagh medical centre for your generous sponsorship. 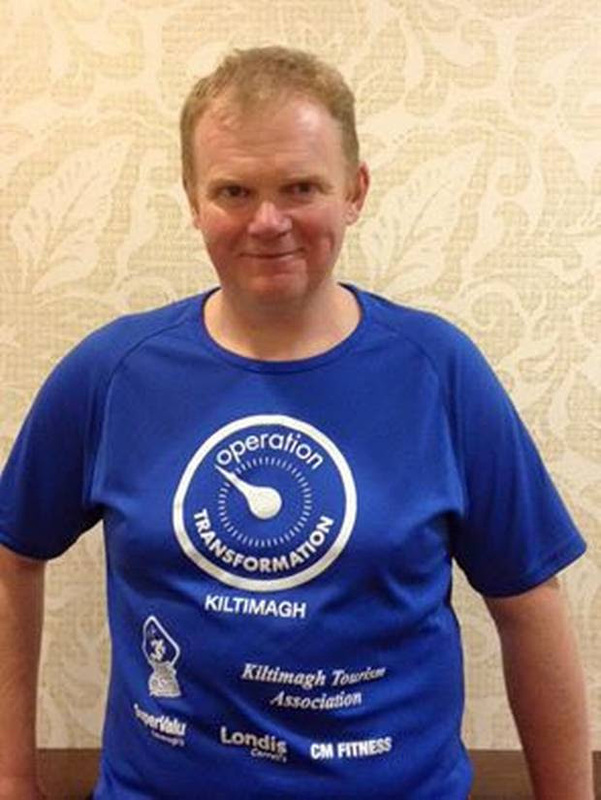 A Mayo man has become the biggest success story of this year’s Operation Transformation after shifting three stone in the seven weeks since the programme began. Michael Moran (43) from Kiltimagh will be credited for his astonishing transformation on tomorrow’s final episode of the show after losing 40lb to date in his local group. “It’s brilliant to be mentioned on the show and it was great to hear that I’m, so far, the biggest loser. It’s great to be recognised. “I feel a lot better for it,” he said. 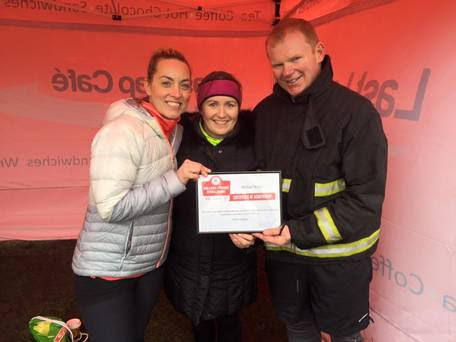 The tiling contractor and part-time fireman revealed that tips from a local dietitian in Mayo helped him recognise how damaging his diet was to his health. At the beginning a local dietitian Aisling Byrne came in and kind of set out the dos and don’ts of eating well and to be honest with you I was doing a lot of the don’ts. “I was eating a lot of white bread, sometimes up to eight slices a day and that alone was a terrible habit, no matter everything else I was doing. “I’ve tackled that and am trying to just eat healthier all around and have more salads and lighter dishes.“When I started the programme I weighed 19 stone 3lb so to be more than three stone down is fantastic. I think the programme has changed my routines for the better and hopefully for the long run,” he said. Although Michael has always been active, he revealed that his problems with weight have been associated with his poor diet and weight piled on when he gave up smoking more than a decade ago.“I gave up smoking about 15 years ago and I piled on about four stone at that point that I just never lost. Although I’ve always been fairly active, my diet was always the killer.